This year’s Society Chieftain is Donald Martin who is currently the Lord-Lieutenant for the Western Isles. Donald was born and brought up in Harris and over a period of 32 years he served in a variety of posts in the Civil Service (in Edinburgh and Inverness) and Local Government in the Western Isles. As one of the few native Gaelic speakers who served as senior officers with Comhairle nan Eilean on its establishment in 1975, he was closely involved in implementing the Comhairle’s Gaelic policy. He took up employment with Comunn na Gàidhlig in 1997 and retired in 2007 as the organisation’s Chief Executive. Since his retirement he has been actively involved in a number of local organisations in Lewis. He is Chairman of Friends of The Nicolson Institute Trust and a Trustee and Vice Chairman of Dileab an t-Siorraidh. He served as Chairman of the Harris Tweed Authority from 2007 to 2013 and is currently Chairman of Acair, the bilingual publishing company. A fluent Gaelic speaker, he is a regular contributor to Gaelic radio and television programmes and was the Scottish Government’s Gaelic Ambassador of the Year 2011. He has a long relationship with voluntary work through the Hospital League of Friends in Stornoway and still volunteers as a driver, entertainments co-ordinator and library volunteer. He became involved in the Western Isles Lieutenancy in 1997 when he was appointed Clerk. In 2002 he was appointed a Deputy Lieutenant and in 2013 he was appointed Vice Lord-Lieutenant, before taking over as Lord-Lieutenant in 2016. He and his wife Sandra live in Stornoway. They have a family of two sons, one daughter and six grandchildren. Top row (L to R): The Royal Oak Society prepare for the procession; the procession 1 & 2; Gaelic Society Piper Euan MacGregor. Middle row (L to R): Donald Martin, Chief of the Gaelic Society; Clan MacGregor, Germany; Ms Carolyn Seggie of the organisation opposing housing development on the battlefield; Matthew John Donnachie. Bottom row (L to R): Some of the wreaths laid at the cairn; ‘Flags of the 45’ - an exhibition mounted by Robert Dennis; the newly refurbished Leanach Cottage; a National Trust for Scotland poster from the cottage. Grew up on my father’s croft at Balmeanach, a small crofting township half way between Struan and Dunvegan on the Isle of Skye. Educated at Vatten Bridge Primary School and Portree High School where I had to stay during the week in the Elgin Hostel for boys which at that time accommodated boys from Harris and Uist as well as from those areas of Skye that were not served by a daily bus service. The bonds of friendship forged in the hostel environment have been strong and long lasting. I am still in regular touch with a number of my fellow hostel pupils. My secondary education was a pleasant experience and I cannot begin to measure the influence the teachers I came into contact with had on my development as a person – Ian Murray who was rector at the time, John Steel, Farquhar Maclean, Calum MacLeod, George Hodson, Robin Murray etc etc. Little did I realise then that Portree High School was to play such a big part in my later life. After secondary school I went on to Glasgow University and eventually graduated with a B. Sc. in Physics and Mathematics. Joined the City of Glasgow Police on Boxing Day 1961 and was posted to Maryhill Division where I spent two years on the beat – day shift and night shift with one day off per week. You certainly saw life in the raw in Maryhill on Friday & Saturday nights and on Glasgow Fair Friday which was our busiest night of the year. There were a lot of Highlanders in the Glasgow Police at that time and it was not unusual to have a conversation with colleagues in Gaelic. In 1964 I went to the Forensic Science Dept. which was part of the Identification Bureau at Force Headquarters at that time. Although it took me away from the hurly burly of street policing it did have the attraction of a steady day shift (8.30 till 5.30) with one week in four on call during the night, once you had gained sufficient experience. Forensic Science today has seen huge advances in methodology and technology and is a long way from what it was in these early days, but ours was the only forensic laboratory in the West of Scotland which meant that we worked on cases from all areas ranging from Dumfries up to Orkney and Shetland and we frequently had to attend courts all over Scotland to give evidence. I think I must have given evidence in most of the courts in Scotland at some time or other. We were inevitably involved in almost all the high profile cases that hit the headlines at that time – probably the most notable that I was associated with was the murder of Rachel Ross in Ayr which resulted in the arrest and conviction of a well known Glasgow criminal Patrick Connelly Meehan. His accomplice at that time was a man called James Griffiths who was killed by police in a shoot out that started when they went to arrest him in his flat in Great Western Road. Paddy was sentenced to life imprisonment but was later given a free pardon and released after serving seven years – this was after a long campaign on his behalf by the celebrated lawyers Joe Beltrami, Sir Nicholas Fairbairn Q.C. and the author and broadcaster Ludovic Kennedy. The whole story is told most graphically in Kennedy’s book “A Presumption of Innocence”. His research for this book was just astonishing – I remember him coming to Skye three times to interview me on the forensic evidence in that case, particularly the pieces of paper that had been found in Griffiths’ jacket pocket. I also remember giving evidence in the High Court in Inverness in connection with a murder that had taken place in Barvas in Lewis – our evidence concerned burned papers found in the accused’s house, but if memory serves me right a verdict of “Not Proven” was returned by the jury. I also remember being a witness in the last case brought against the famous safeblower Johnny Ramensky, who during the war had been taken out of Barlinnie prison and parachuted behind enemy lines to blow a safe in a German military base and steal secret papers. I was fascinated by this stocky little placid looking man who seemed to be addicted to a criminal lifestyle and who had gained such notoriety by escaping from all the prisons in which he had been incarcerated. He was the subject of Matt McGinn’s famous song “Open up your prison gates and let Ramensky go”. Johnny died, a broken and embittered man in Peterhead prison. After almost ten years in the police service I resigned, went to Jordanhill College of Education and set out on my second career – teaching. My first teaching post was in a small rural East African village called Machakos, about 40 miles from Nairobi, where I did a two year contract with the Ministry of Overseas Development as a teacher of Physics and General Science. These two years in Kenya were idyllic, doing a job that enjoyed such status and was so much appreciated by pupils and by my African colleagues. The climate, the way of life, the wildlife, the holidays at the beaches of Mombasa will all live with me forever, but the abiding memory will be of a poor but happy and resourceful people. At the end of our contract we came home and I eventually secured a post as a teacher of Physics and Warden of the hostel at my old school, Portree High. Going back as a member of staff and meeting as colleagues some of my former teachers was a strange experience but they made me feel most welcome. A number of my fellow pupils were also on the staff then, Alister Ross who was Depute Head, Janet MacLeod Asst Head, Stanley Robertson, Head of Chemistry, D R MacDonald, Head of Gaelic, later joined by others such as Ian George MacDonald, Robert MacDonald, Murdina Stewart, Shona Cormack etc etc. That must be one of the great strengths of schools like Portree – the large percentage of teachers from the ranks of former pupils. I took early retirement in 1991 just as Gaelic Medium pupils were beginning to feed through from the GM primaries, and, after a few years doing other things I was eventually lured back as a part time teacher of Gaelic Medium Science and Maths. Thus began the most enjoyable and most fulfilling part of my entire teaching career. Because I was part time I was not burdened with the overwhelming bureaucracy which is the bane of teachers’ lives today – I simply taught my classes, wrote their annual reports and met with their parents on parents’ evenings. That was so enjoyable – small classes, really nice well motivated pupils and supportive parents, and being part of that great success story, Gaelic Medium education. I finally retired a few years ago but I am kept busy translating Science teaching materials into Gaelic. I am also involved in the course for Gaelic Medium subject teachers delivered by Sabhal Mor Ostaig and Aberdeen University – the “Cùrsa Streap”. This is an excellent course, not just for Gaelic Medium subject teachers, but also for Gaelic speaking teachers who at present do not teach their subjects through the medium of Gaelic but who may be interested in doing so in the future. After retiral from teaching I became involved in Sir Iain Noble’s Gaelic charity “Urras an Eilein” and among many other projects we have arranged a number of visits to the great war sites of the Western Front where so many young Highlanders perished. We held remembrance services in Gaelic at all the places we visited and on our second trip we had the great pleasure of visiting St Valery-en-Caux along with two ex-Seaforths who had been captured there in June 1940. It was very moving to see how the people of St Valery honoured these two men – they even had a civic reception in the town hall where the two veterans were taken on stage and introduced to the Mayor who presented them with special medals. I consider myself especially privileged to have had the opportunity to meet, talk with and get to know such men. These visits, along with other visits accompanying school groups and holidays with my wife when we have walked round the battlefields, have had a lasting impression on me – the horrors of the great battles fought around the town of Ypres where 100,000 who have no known grave are remembered by name on the great memorials to the missing, especially the Menin Gate where an act of remembrance is held every evening at 8pm, every night of the year. The Somme – scene of that blood-soaked massacre forever etched on the British psyche and whose very name conjures up all the horror of the Western Front – is another unforgettable area where you find so many Highlanders in the cemeteries and on the memorials that pepper the countryside. A television crew followed us on our first visit resulting in the acclaimed programme “Na Laoich”. Latterly, however, my main pre-occupation has been my three grandsons who have brought such joy into my life and of whom I am so immensely proud. The Gaelic Society's annual outing this year was to Sabhal Mòr Ostaig. College staff, past and present, led by Professor Hugh Cheape (our Chief in 2016/17) described its history and future plans, and members were able to explore the original buildings and the new campus. Tha bliadhna thrang air a bhith aig a’ Chomunn, mar is àbhaist, agus tha sinn air-leth taingeil gu bheil òraidichean cho comasach air a bhith againn. Tha sinn cuideachd a’ toirt taing don Ollamh, Ùisdean Cheape, Ceannard 2016-2017, airson an taic a thug e don Chomunn fad na bliadhna bho Sheirbheis Cuimhneachaidh Chùil Lodair, Òraid dìnnear bhliadhnail san t-Samhain agus a-rithist aig a’ choinneamh bhliadhnail sa Ghiblean 2017. Bha deagh Chuirm againn bho chionn ghoirid. Tha ceilidh neo-fhoirmeil a’ còrdadh ris na h-uile agus tha sinn mòran an comain na ghabh pàirt air an oidhche. Bu mhath leinn cuideachd taing a thoirt airson maoineachadh bho Stòras Choitcheann Inbhir Nis agus Sonas. Tha a’ chomataidh air pàipearan a thaghadh airson na ath-bhliadhna agus tha sinn an dòchas gun cùm sibh bhur taic ri na h-òraidichean mar is dual dhuibh. Ma tha neach sam bith ag iarraidh lioft gu na coinneamhan, cuiribh fios thugainn. The past year has been another busy one for the Society. Meetings have been held in the Gaelic Primary School and have covered a wide range of topics including: Researching the Life of Màiri Mhòr nan Òran, William Clunes, shinty, sheep, and clearance in early nineteenth century Sutherland,and Dùghall Bochanan, to name but a few. Once again we are fortunate to have had a variety of papers of such high quality read at our meetings. We wish to record our sincere thanks to our speakers throughout the year: Calum Cameron-White, Liz Macrae-Shaw, Hugh Cheape, Jim Hunter, Hugh Dan Maclennan, Derek Flyn, Allan Turner, Donald Meek and Hector Mackenzie. 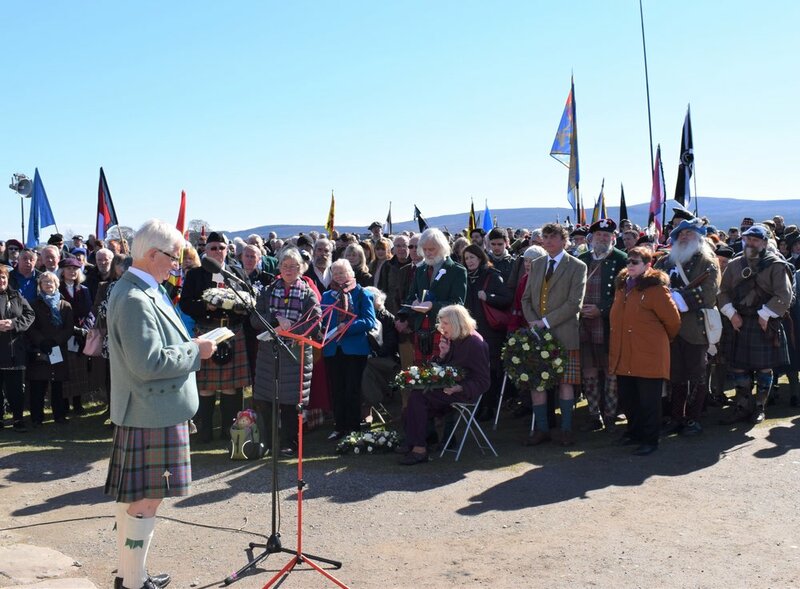 Thanks are also due to all those who took part in the Culloden Anniversary Service. To the many faithful members who turn out to these meetings, a very special thanks to you. If you are aware of anyone requiring a lift to meetings, please get in touch with a member of committee. We had a beautiful day for last year’s annual outing. We were very fortunate in having Society member, William McRobbie providing a commentary throughout the trip to Gairloch. Volume LXVII of the Transactions should be with the members by now. Please get in touch if you have not received your copy. Jo MacDonald is a native Gaelic speaker from the island of Lewis. During her career spent largely with the BBC, she worked mainly in factual and education programming. Before leaving the BBC at the end of 2008 she was Managing Editor of BBC Gàidhlig, a tri-media department whose output includes the national Gaelic radio service BBC Radio nan Gaidheal; a wide range of television programming for the new Gaelic channel BBC ALBA and for BBC2; and the Gaelic website bbcalba.co.uk. She was also member of MAGOG whose 2002 report to Scottish ministers recommended the establishment of a body which would take a strategic approach to Gaelic Development activities. Jo now works as a freelance researcher, writer, broadcaster and translator. She is a member of An Seotal ’s Gaelic terminology panel and a member of The Sorley Maclean Trust. Is e Leòdhasach a tha fileanta sa Ghàidhlig, a tha ann an Jo NicDhòmhnaill. Rè a beatha-obrach, a chur i seachad gu ìre mhòr aig a’ BhBC, bha i aig àrd-ìre ann an rèidio, telebhisean agus air-loidhne. Mun àm a dh’fhàg i am BBC aig deireadh 2008 bha i na Manaidsear Deasachaidh aig BBC Gàidhlig. Tha i a-nise ag obair air a ceann fhèin mar sgrìobhaiche, rannsaiche, eadar-theangair agus craoladair. Bha i na ball den bhuidheann MAGOG a mhol don Riaghaltas ann an 2002 buidheann a stèidheachadh a ghabhadh uallach airson ro-innleachd leasachaidh na Gàidhlig. Tha Jo na ball den t-Seotal, am pannal airson briathrachas Gàidhlig agus na ball de dh’Urras Shomhairle MhicIlleathain. The Chief delivers the address at the Culloden Anniversary Service, April 15th 2017, the Society’s annual dinner on November 4th and finally at the annual business meeting on April 13th 2018. A very warm welcome to Jo in her year as Chief to the Society. The Anniversary Service will be held at the Cairn on Saturday 15th April. This will follow the usual pattern with the Society Chief, Jo Macdonald, giving an Address. This is followed by prayers and a blessing by Rev.K.D Macleod, Invergordon and Rev Canon Mel Langille, Fortrose, respectively. Gaelic Psalm singing will be part of the service with Donald Roderick MacAskill and friends, Dingwall, leading the praise. The Society’s Bard, Maoilios Caimbeul, will read verses from the poem: Am Breacan Uallach, The Proud Plaid, by Alasdair Mac Mhaighstir Alasdair. 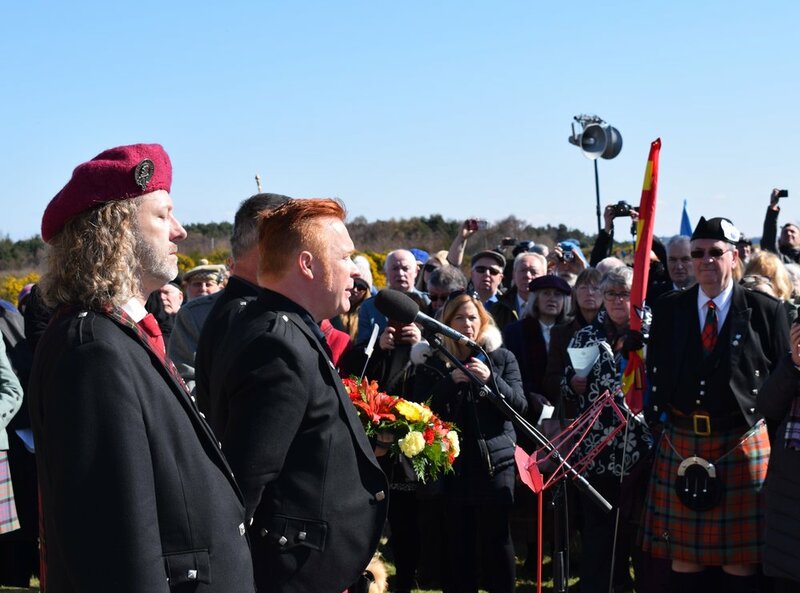 An appropriate lament will be played by the Society Honorary Piper, Mr Euan J. J. MacCrimmon, after which a wreath will be laid on behalf of the Society by Jo Macdonald. The summer outing this year will take place on Saturday 27th May to Sabhal Mòr Ostaig, the Gaelic College on Skye. There are one or two places still available on this day trip. Please contact the Secretary to book a seat on the coach. The cost is £25 for the coach hire. Please visit our website at www.gsi.org.uk for all information regarding the Society and the latest news. The website has been up-dated and we are very grateful to Donald John Macleod, Librarian, for his work in keeping the site up-to-date as well as our Facebook page! To keep down postage costs, newsletters will appear on our website. A paper copy will be issued on request. A collection of 200 books of Jacobite interest has been received from the estate of the late Miss Christian Aikman of Morar, a vice-president of the 1745 Association. Our classified index to the Society’s Transactions has recently been updated and is available on the GSI website. We welcomed a substantial number of new members this past year. Our Treasurer, Donald Norman MacLeod, is grateful to all of you who complied with the request to pay your subscription by Standing Order. Those of you who have not yet taken advantage of this facility are reminded that this can be done by contacting the Treasurer at any time. Membership is currently £20 per annum and is due for renewal on 15th July each year. Sending reminders to such a large membership is quite costly, so please put this date in your diary to avoid any lapse of your membership. Anyone requiring further information should contact the Treasurer. Students at Universities and Colleges may join the Society at the reduced fee of £10 per annum. Sadly, we have had to record the loss of some of our members and friends in the past few months. We would like to extend our sincere sympathy to those members who are mourning the loss of family and friends at this time. We would ask that you keep us informed of the passing of any of our members in order that a formal tribute may be paid to them at our members’ meetings and subsequently recorded in the Society Transactions. Finally, we would like to express our thanks to Highland Council and the Inverness Gaelic School for the use of their premises for our meetings. Professor Donald Meek gave an interesting and insightful talk on the poetry of Dugald Buchanan to the Society on Thursday 23rd February. Donald is the editor ofthe latest edition of Buchanan’s poetry, Laoidhean Spioradail Dhùghaill Bhochanain, which was published by the Scottish Gaelic Texts Society in 2016. The talk, which began as shown here, will be published in volume LXVIII of the Society’s Transactions, which is due in 2018. “Is cinnteach nach eil mòran agaibh nach cuala mu Dhùghall Bochanan, am bàrd spioradail as ainmeile ann an litreachas na Gàidhlig. Cluinnear aon de na laoidhean aige, ‘Fulangas Chrìosd’, ga seinn gus an là an-diugh, mar as trice le Màiri Mhoireasdan, agus tha daoine gu math measail air an laoidh sin fhathast. Bha earrann de dh’ aon eile de na laoidhean aige, ‘Là a’ Bhreitheanais’, ga seinn ann am Muile gu meadhan na ficheadamh linn, agus fonn rithe coltach ri aon de na seann laoidhean Oiseanach. B’ e ‘Là a’ Bhreitheanais’ an laoidh a b’ fhaide a rinn Bochanan, agus tha i gu math eadar-dhealaichte seach na dàin eile a dh’fhoillsich e ann an leabhar beag de dh’ ochd laoidhean a chaidh a chlò-bhualadh ann an Dùn Èideann ann an 1767 fon ainm Laoidhe Spioradail, le Balfour, Auld agus Smellie, na clò-bhualadairean a thug dhuinn an Tiomnadh Nuadh Gàidhlig anns an aon bhliadhna – agus bidh sibh mothachail, ma tha sibh math air cùnntas, gu bheil dà cheud gu leth bliadhna ann, am bliadhna fhèin, bhon a thachair sin. “Bha Bochanan ann an Dùn Èideann aig an àm, ’s e a’ stiùireadh an Tiomnaidh Nuaidh tron chlò às leth an SSPCK. ’S e rud mòr a bh’ ann gun deachaidh an Tiomnadh Nuadh Gàidhlig agus an leabhar aig Bochanan fhoillseachadh aig an aon àm agus leis na h-aon chlò-bhualadairean. Tha sin na thomhas air an luach a bha ga chur air na laoidhean aige, ged nach eil fhios againn cò leis. Cha robh ann am Bochanan ach maighstir-sgoile ann an seirbhis nan Oighreachdan Dì-chòirichte (Forfeited Estates) agus an SSPCK ann am Bun Rainich agus ann an Ceann Loch Rainich, agus faodaidh sinn a bhith cinnteach nach biodh gu leòr a dh’airgead aige airson leabhar da leithid fhoillseachadh. Feumaidh gun robh neach-taic air choreigin air chùl chùisean, a bha a’ cur luach mòr air saothair an duine seo, ach chan eil fhios againn cò e.
"Jo MacDonald is a native Gaelic speaker from the island of Lewis. During her career spent largely with the BBC, she worked mainly in factual and education programming. Before leaving the BBC at the end of 2008 she was Managing Editor of BBC Gàidhlig, a tri-media department whose output includes the national Gaelic radio service BBC Radio nan Gàidheal; a wide range of television programming for the new Gaelic channel BBC ALBA and for BBC2; and the Gaelic website bbcalba.co.uk. "She was also a member of MAGOG whose 2002 report to Scottish ministers recommended the establishment of a body which would take a strategic approach to Gaelic Development activities. "Jo now works as a freelance researcher, writer, broadcaster and translator. She is a member of An Seotal ’s Gaelic terminology panel and a member of The Sorley Maclean Trust. "Is e Leòdhasach a tha fileanta sa Ghàidhlig a tha ann an Jo NicDhòmhnaill. Rè a beatha-obrach, a chuir i seachad gu ìre mhòr aig a’ BhBC, bha i aig àrd-ìre ann an rèidio, telebhisean agus air-loidhne. Mun àm a dh’fhàg i am BBC aig deireadh 2008 bha i na Manaidsear Deasachaidh aig BBC Gàidhlig. Tha i a-nise ag obair air a ceann fhèin mar sgrìobhaiche, rannsaiche, eadar-theangair agus craoladair. "Bha i na ball den bhuidheann MAGOG a mhol don Riaghaltas ann an 2002 buidheann a stèidheachadh a ghabhadh uallach airson ro-innleachd leasachaidh na Gàidhlig. "Tha Jo na ball den t-Seotal, am pannal airson briathrachas Gàidhlig agus na ball de dh’Urras Shomhairle MhicIlleathain."